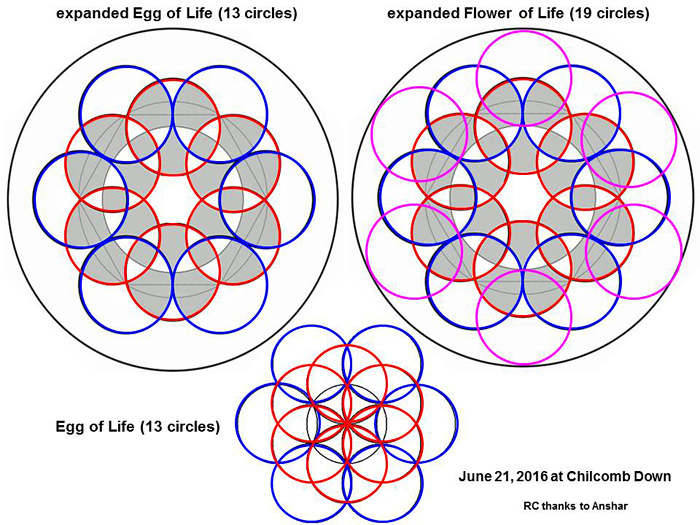 The three most fundamental shapes of “sacred geometry” are a “Seed of Life” with 6 + 1 = 7 circles, an “Egg of Life” with 12 + 1 = 13 circles, and a “Flower of Life” with 18 + 1 = 19 circles (see flower-life). 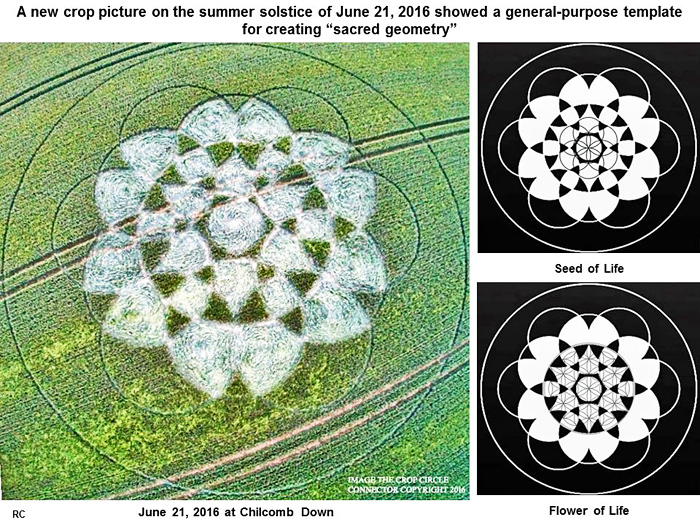 The “Seed of Life” may show a “hexagon” at its centre, owing to underlying six-fold symmetry (see www.youtube.com). To be precise, it shows a slightly-expanded “Egg of Life”, not seen previously to my knowledge in studies of “sacred geometry” on Earth. 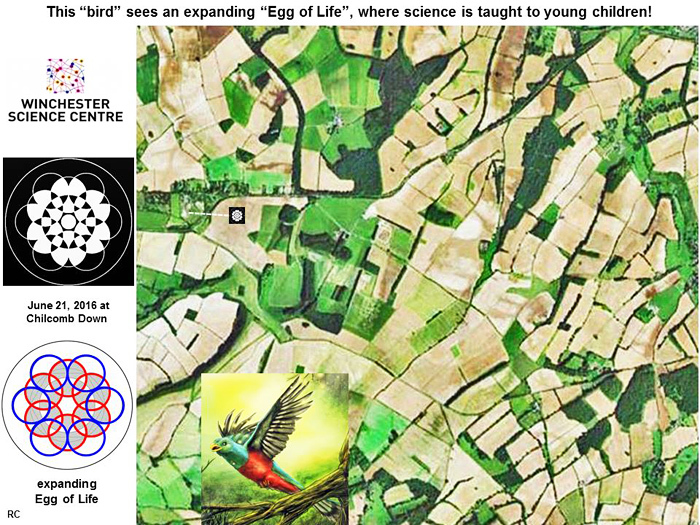 The central circle for an “Egg of Life” has been drawn about 1.5 times larger, than two rings of six circles which surround it (please see other slides on chilcombdown comments). 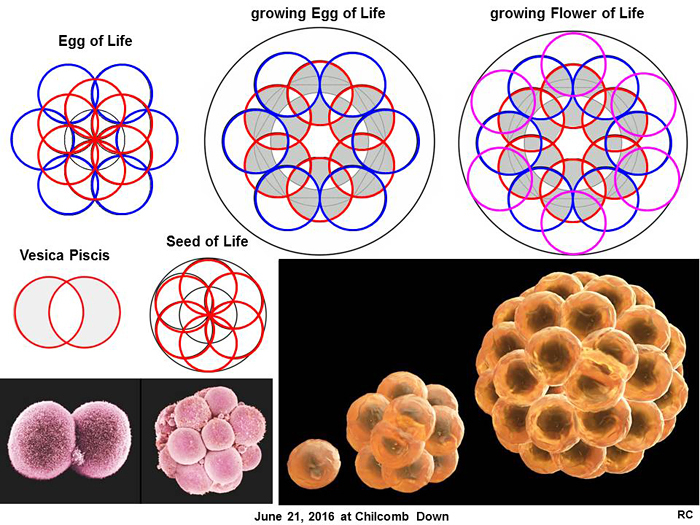 By adding successive rings of six circles, we can change from a “Seed of Life” to an “Egg of Life” to a “Flower of Life”. Likewise by increasing the size of the central circle, in any of these shapes, from the same diameter as surrounding circles to about 1.5 times larger, we can change from a “normal” to an “expanded” form of sacred geometry. 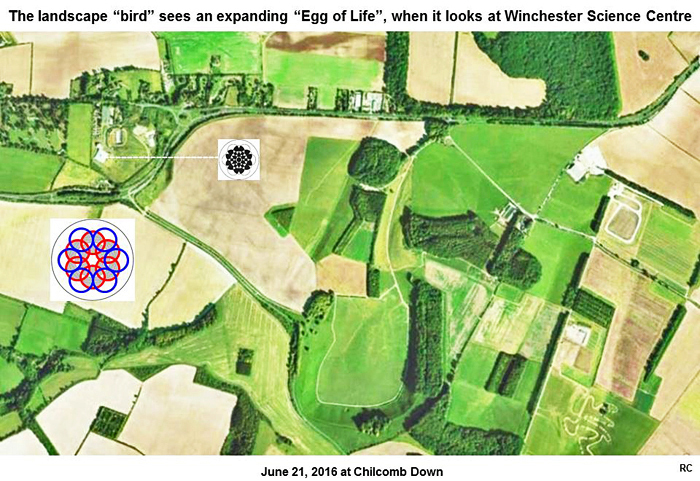 Its central “hexagon” shape, which was created by a slight expansion of the central circle in an “Egg of Life”, points toward another group of unspecified buildings on the right (as noted by another thin, white dashed line on the right). The upper of two thin, white dashed lines joins this crop picture to the “eye” of a landscape “bird”. 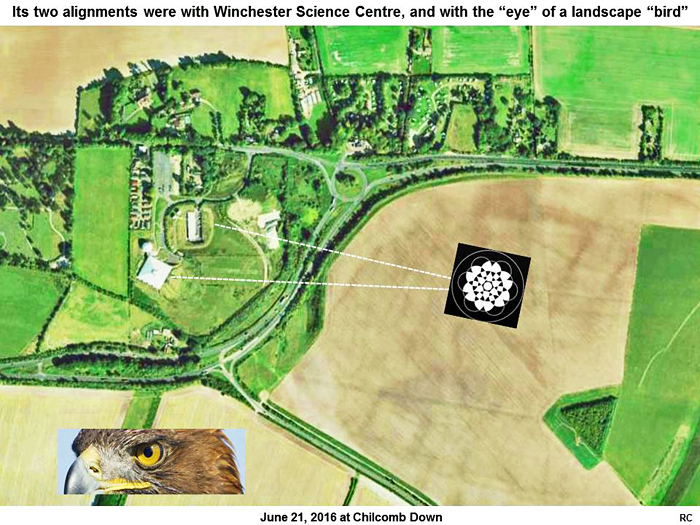 The lower of two thin, white dashed lines joins the Chilcomb Down crop picture to Winchester Science Centre on the left. To the right of this crop picture, and slightly below, we can see a “large green triangle” in the landscape. This feature resembles many “small triangles” in the crop picture itself, and points similarly toward the “eye” of that landscape “bird”. What a clever metaphor for scientific enlightenment! 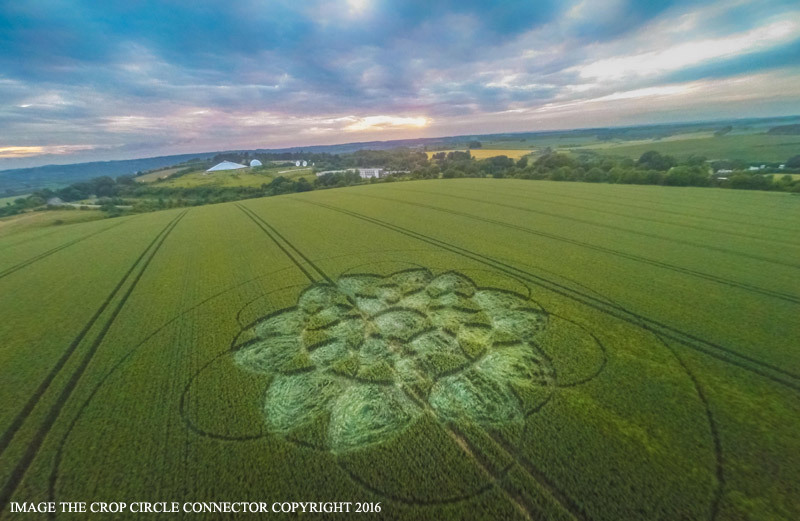 In summary, this new crop picture at Chilcomb Down on June 21, 2016 seems to present us with two overlapping meanings. First it provides a useful “template” by which young children from a nearby Science Centre can draw “sacred geometry” on paper. Secondly it suggests that the process of teaching science to young children is a highly beneficial activity, which may be compared with an expanding or growing “Egg of Life”. How long will most scientists on Earth remain narrow-minded and blind? When will scientists on Earth, such as those who administer the Winchester Science Centre and Planetarium, begin to study such complex field patterns? Rather than ignoring them in the same way that the Pope ignored the moons of Jupiter, or phases of Venus, when these phenomena were first seen through Galileo’s small telescope in 1620? (see galileo). 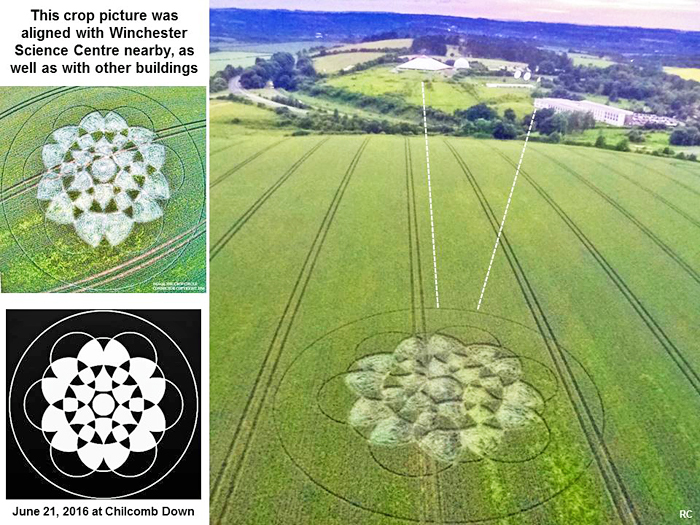 Six major crop pictures have appeared now near radio telescopes, yet almost all astronomers on Earth remain narrow-minded and “blind” (see fringe2014t).